We are all aware of their bad reputation and ability to interrupt whatever it was we were doing before they, well, popped up. 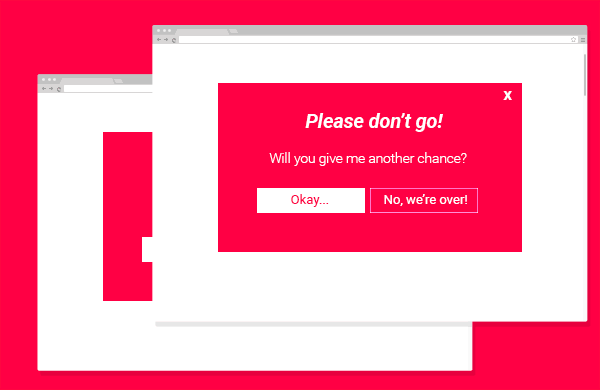 Pop-ups are known to be pure evil, and if most of your users think the same, then not only they’ll be useless, they’ll also drive your visitors away. Spoilers: Never. It’s never worth to sacrifice your relationship with your users. But is there a way around pop-ups that will make them, let’s say, less annoying? Or better yet, is there a way to use pop-ups without ruining user experience? There are definitely ways of making the standard pop up less annoying. Now let’s be honest here. Pop-ups by definition aren’t UX best friends. When someone lands on your website, they are trying to find or achieve something – this is their goal. Business goals and user goals aren’t always aligned. In this case, pop-ups don’t focus on the user, they focus on one of your business goals. So yes, maybe pop-ups aren’t exactly good UX, but can we justify their implementation for the sake of conversions? Let’s start with understanding what are pop-ups, why do they exist, and why do we sacrifice some usability principles to implement them. You already know what pop-ups are: those small or not-so-small boxes that block part or all of your screen when you are visiting a website. Like many other things on the web, they usually challenge the ‘user control and freedom’ (which is also one of the 10 Usability Heuristics by Nielsen). 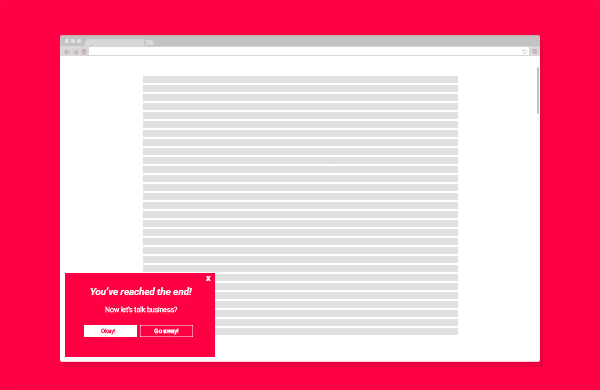 When pop-ups are done right, they can be very powerful. Their attention-grabbing appeal is obvious – of course, it’s easier to focus on something when there isn’t anything else to distract you. But be aware of forcing your visitors into focusing on something they have no interest in, and also keep in mind that if we’re programmed to ‘banner blindness’, high chances that we’re also programmed to instinctively close your pretty pop-up before we even read the content. But before you decide to give up on pop-ups forever, let’s look at some of the stats. Conversions. 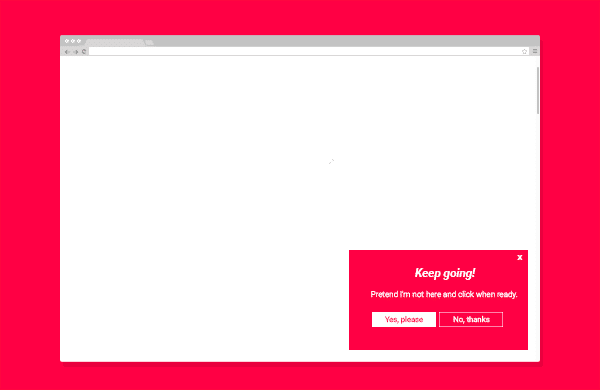 The reason why we see so many pop-ups these days is that they work. WP Beginner saw an increase in sign-ups by 600% thanks to exit-intent pop-ups. Bounce Rate. You’d think that pop-ups would make your visitors leave your page sooner than usual. The truth is that stats prove that this is not always the case. But bounce rate doesn’t measure long-term impact. Engagement. Numbers can be tricky. You might be getting email subscribers (for example). It doesn’t always mean they are the right type of subscribers who’ll engage with your emails. See Mauro D’Andrea’s example. Your credibility and trust. 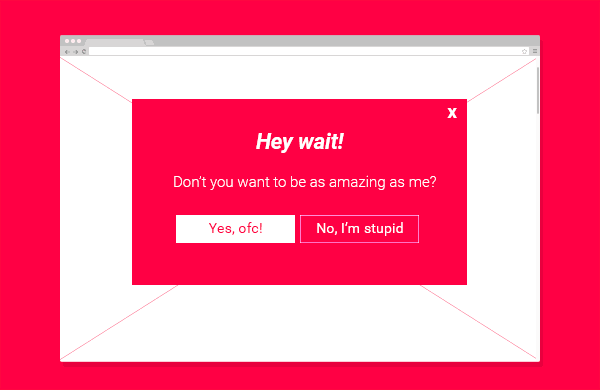 In UX design, pop-ups fit into the ‘needy patterns’. These are considered less immoral than dark patterns but still with the potential to hurt your relationship with your users. Once pros and cons are weighed, only you can decide for yourself if pop-ups are right for your website and business. But if you’re going to prioritize your business goals over your user needs, at least try to make this experience as user-friendly as possible. Tip #1 – Let your visitors get out! Back to user control and freedom, this is the worst you can do. Please don’t trap your visitors especially if your pop-up is huge and blocks any interaction with the rest of the page. The very least you can do is to include an obvious X and/or a No, thanks. Online Marketers will probably hate me, but please stop rewording “No, thanks” – which is explicit enough, especially if you’re going to use patronizing marketer speech: “No, thanks, I’m already rich”, “No, thanks, I don’t want to be amazing”. If I need to click on something I don’t agree with just to get out of your pop-up I will. Then, I’ll probably leave the website as well. I know what you’re thinking. If you hide your pop-up in a corner and let your visitor continue browsing, the No Distractions rule is pretty much broken. Maybe, but hey… You still got their attention, right? So now you’ve given them the choice of looking or not at your pop-up. Tip #3 – Only because they’re leaving? Now if you are someone who, like me, has I-don’t-know-how-many-tabs open at the same time, you can quickly guess that nope, perhaps your visitors were not leaving. Perhaps they were just switching tabs to come back to your tab later, but the unexpected pop-up interrupted their work-flow. These pop-ups are especially critical if they hide most of the content of your page and don’t let your visitors get out (as mentioned above, never do this!) Remember, “if you love something, set it free”. One way to make these exit intent pop-ups less annoying is to combine them with the strategy of not hiding your content. Make them small and subtle, and don’t make your visitors stop what they were doing just because a box decided to pop up. The very popular scroll box involves usually a combination of the methods mentioned above and is another pop-up that is triggered via behavior. Typically, the scroll box shows up at the right bottom corner of the page once your visitor has read most or all of the content. You’ll have more chances of your users hating you if you spam them with the very same pop-up box every time they visit your website. Also, if I’ve already signed up to your offer, I’ll definitely don’t want to see it once again. Cookies, in this case, are your friend. When it comes to mobile, it’s better to just leave the pop-ups out. Besides the issues with size and positioning, the close button has to be placed differently for optimal user experience and also depending on the operating system and device. Nothing more annoying than scrolling through a pop-up box on your mobile without being able to get out of it. Bottom line: Are your pop-ups helping who? Truth be told, sometimes we can get away with being slightly annoying (and this doesn’t mean spamming or tricking your users, okay?) “Dear Pop-up, you’ve interrupted me but hey, this is an amazing article!” or “No way, Pop-up, you’ve just found the product I was looking for! I knew I have seen it before but couldn’t remember where.” These are classic examples of how you can guide your users while still pushing them towards your conversion goals. These are also examples of how you can give the control back to them. Your visitors can read your article and check your product without the commitment – they don’t need to give you their email address or purchase your product right away unless they want to. Thinking about your users first can be a game-changer but not one that will give you quick results overnight. No matter how tempting short-term conversion is, you need to be sure that your decisions won’t affect how your brand is perceived and that they won’t have a negative impact on your business in the long run. 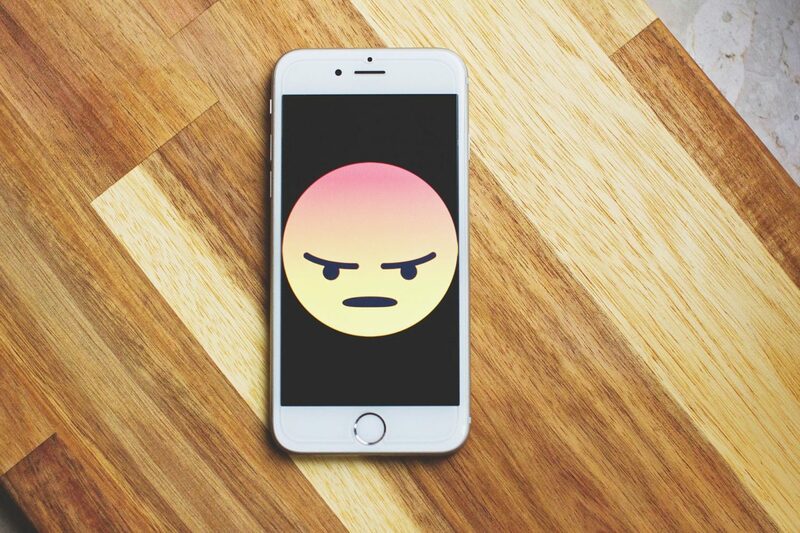 Focusing purely on usability means prioritizing your user needs over your conversion goals, which might sound to you like a dangerous game to play. After all, your business goals are important too. As everything else, balance is important. Just remember that happy users will most likely convert, maybe not today, maybe not tomorrow; but if what you offer is truly valuable, they will come to you of their own free will. These users will respect you, trust you and admire you. Have you made up your mind yet whether pop-ups align or not with your business and website goals? Love this post on popups! I am not a fan of popups at all as they really irritate me when they appear. This is why I opted to not have any on my website at the sacrifice of getting more subscribers. I guess there are pros and cons to both options!